The weather here has been very photogenic lately. I say photogenic rather than nice, because it has felt more like October than late August. It has not cracked 70° in several days, though it's beautifully sunny. We have been doing a bunch of butterfly releases. On Sunday we brought 70 Silver-bordered Fritillaries up to Glacial Park in McHenry County. We have done releases there before, with little success. This year, we opted to try a release in a wetter, sedgier part of the park. Vincent opens the flight cage. We tried a different method of transporting the butterflies this time. Instead of placing them in individual containers and chilling them for the trip out, we left them in a flight cage. We just carried the cage out onto the prairie and opened it. I was skeptical- but it worked pretty well. The butterflies began flying immediately, but they didn't leave the area. Most very quickly landed on sunflowers and began feeding. We saw a lot of courtship activity- always a good sign. directly over to these flowers to begin feeding. Yoesterday we headed out to the Fermi National Accelerator Laboratory to release caterpillars of Baltimore Checkerspots. This is a really gorgeous species that we had not previously worked with. So far, we have been very successful- we have over 1500 caterpillars in the lab. Yesterday, we placed 250 of them out on plants. Female Baltimore Checkerspots lay their eggs on Turtlehead, the primary host plant in this part of the country. That's the plant that we put the caterpillars on. The caterpillars have just about finished eating for the year. They will spin a communal web near the base of the plant where they will spend the winter. We kept most of the Baltimore Checkerspot caterpillars in the lab. They will be held over the winter on the Museum roof and reared to adulthood in the lab. Next June, we will add the adults to the same release site. Next summer, we hope to see lots of adult Baltimore Checkerspots out on the grounds of Fermi. We want to see lots of this at Fermi Lab next summer. Great work, Doug! That Baltimore Checkerspot is drop-dead gorgeous. Your picture shows how turtlehead got it's name. I don't think we have that here. Glacial Park is an awesome place! Great job! I love Checkerspots. Speaking of, I found this website while Googling for "raising hibernating caterpillars." I found just yesterday about 40 Silvery Checkerspots Chlosyne nycteis on Wingstem, which grows near us. 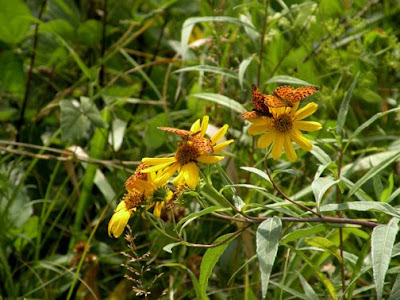 They also feed on Black-Eyed Susans Rudbeckia, which we have in our garden, so hostplants are not an issue. However, this species hibernates as 3rd-instar cats, much as the Baltimore Checkerspots do. What is the best way to provide a safe hibernating environment for my caterpillars? I'm currently considering a mass "sleeving" of a section of Rudbeckia, or else putting several of them in pots, and then putting the pots in our shed. Steve- Thanks. There are Baltimore Checkerspots on Cape Ann. I've seen them along the B&M tracks right near the Gloucester/Manchester town line. You need to look in late June. FC- You're right. It doesn't get south of Georgia. Jeff- Welcome to the Tapestry. I blogged about a mothod for overwintering chekerspot butterflies here. Briefly, you put the larvae in crumpled paper towels in a lidded container, then place the container in a sheltered spot outside under an upended terracotta pot. We had over 50% survival last year with Gorgone Checkerspots in a winter that got down to -20°F.